This is a low-cost, low-key but high-impact vehicle advertising option, even for people who are averse to having marketing messages splashed all over their vehicles. Total cost is about $300 ($251.65 for Ontario plates + about $10 for internet domain name + about $50 for custom vinyl lettering). The best part is, this mini ad will work 24/7 for many years, and the more you drive your vehicle the harder it will work for you. Register a custom license plate that somehow relates to your business. 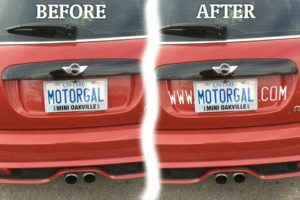 In this example, MOTORGAL is an Ontario license plate owned by a car salesperson. This guerrilla marketing tactic works best if your whole company name can fit on an 8-character maximum allowed in Ontario (other jurisdictions may have different limitations), for example, if your business name is Miralco or Impeco, you should be fine. Only register your custom license plate if you can also register a matching .COM or other domain name. In case your business name is longer than 8 characters, for example Daniel Durst State Farm Insurance, you could use DDINSURE and register a .CA (Canadian) domain name. Once you pick a domain name, if it’s not your main domain, set up your new domain to simply forward to your main web site, so in this example Daniel would set up DDINSURE.ca to forward to his DanielDurst.com web site. If you were able to register a custom plate and found a matching domain name, the final touch is to add the letters WWW. to the left of your custom car plate and then .COM to the right (if the .COM is taken, you can try a .CA or .BIZ, but ideally you should try to find an available .COM). Simply ask any local signage company to cut these letters for you from reflective vinyl. If your vehicle colour is dark (e.g. red, blue, green, etc.) use white vinyl, if your car’s colour is white or light-coloured, use dark blue (for Ontario plates) or simply match the colour of the letters on your licence plate. Feel free to use this PDF file to cut letters for an Ontario plate. If your own plates use a different font, or size, please forward a template to me and I will add the file to this blog post, or provide a link to a file in the comment section below. 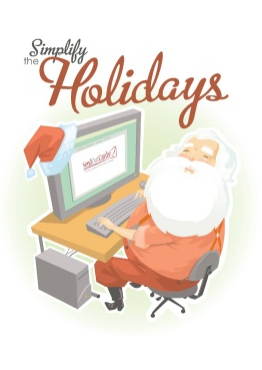 Are You “Going Postal” This Holiday Season? I knew that title will intrigue you, please feel free to comment. These days we rarely receive anything other than bills and junk mail in our mail boxes, so if you take the time to send a real greeting card to your clients, business partners and suppliers, you will stand out from the crowd. I personally use an online service called SendOutCards, which gives me the flexibility of creating a greeting card campaign and then selecting a group of people to receive it. Groups such as: clients, suppliers, friends, family, etc. SendOutCards prints, addresses, personalizes and sends real postcards, greeting cards, and gifts, etc. through the postal system. This is not an e-card service. SOC also allows me to enclose a gift with my greeting card, such as Starbucks or Tim Hortons gift cards, books, cookies, etc. I also had them digitize my own handwriting and signatures into a font, so my cards look like they were handwritten. How cool is that! The system is getting better and better. Now they also offer printing of calendars, posters, even business cards. If you just built a new web site, or if you follow my advice — a business blog — you should announce it to everyone you know to attract them to visit. Although you can and should use opt-in email marketing systems to send an announcement to your contacts, I’d like to propose an “off-line” marketing strategy as well: postcards or greeting cards! If your budget allows it, I recommend sending postcards to your existing clients asking them to promote your new blog to their contacts. To create personalized postcards, or greeting cards, I use my SendOutCards system which costs me $0.62 + postage for a postcard with a custom design ($0.31 for a stock card). The design can be an advert for your new blog, and then on the flip side (or inside of a greeting card) you can ask the recipient to give a unique URL to their contacts, e.g. NewBlog.com/Joe, etc. where Joe is the real name of your client. Using a unique URL will allow you to track new visitors/signups, and then award the one client who sends the most traffic to your new blog. You need to give your clients an incentive to promote your new blog, say a chance to win an iPod or something, or something more expensive, depending on your business model. Follow this link if you’re interested in the SendOutCards business opportunity. This can become a lucrative second income or a full-blown career, all depends on you. Do You Use Postcards to Generate Leads and Repeat Business? Although email marketing is still the most effective way to promote your business, there are other ways of generating leads or getting more business from existing clients. I’ve been using custom postcards for over 10 years with great results! benefits of sending your prospects and customers a tangible item? Would you be interested in trying this almost perfect business-generating system? More than ten years ago I started using Send Out Cards, an online on-demand printing and delivery system that works very much like sending personalized email, only it prints,personalizes and mails real postcards and greeting cards in any quantity. Want to add a Starbucks or Tim Hortons gift card? No problem! Cookies? Candy? Yes, and yes, it’s so easy. You can use this system to send automated, but personalized postcards and greeting cards. Thousands of great stock designs are available, but best of all, you can easily create your own designs as simply as uploading digital photos, logos, and adding a voice bubble, clip art or a caption. Using Send Out Cards is a great way to get repeat business from existing clients. Additionally, you can use this system is to split-test different cards on a smaller sample, to see which one to use in bulk, if you’re planning to ultimately send a large-scale direct mail campaign (1,000 or more cards). On top of it all, if you’re looking for a source of additional income, SendOutCards offers a very lucrative business opportunity as well. Contact me if you’re interested in testing it out – I can set you up with a gift account so you can try the system and send yourself a few cards on me, or simply follow this link to send a test card now, for free!